The most important thing to remember is that horse camping should be a pleasant experience for both horse and rider. When deciding how much to bring when you go horse camping with just your trail horses, it is important to remember that horses are like people...some are stronger than others and can carry more weight. However, even if you have a very strong, fit horse, I am afraid you are going to have to leave many of your luxury items at home on this trip and think like a back packer. Ultra-light back packing gear is available nationwide and with this type of equipment, you should be able to pack a tent, cook stove and fuel, sleeping bag and personal necessities for a very comfortable trip with just hornbags and horse saddlebags, like the TrailMax™ Saddlebag System. Common sense needs to prevail when loading your horse saddlebags and hornbags. Horses carry weight better over their shoulders than behind the saddle, so the heaviest items should be loaded in the hornbags whenever possible. 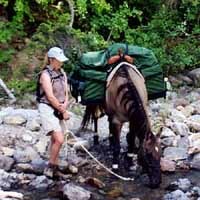 Pack the lighter, bulkier horse camping items in the saddlebags and cantlebag. Ideally, at least two people will be going, enabling them to share things like a back packing stove, utensils, first aid, ultra-light tent, etc. If you are riding a fully loaded trail horse, you should keep your days short and don't forget to get off and walk now and then to give your horse a break. To help you decide how much weight to load on each trail horse, read more in How Much Weight Can My Horse Carry? If you need or want to pack in more gear for your horse camping trip and don't mind hiking in, TrailMax™ Saddle Panniers or the TrailMax™ Pack-A-Saddle™ are also a viable option. These saddle panniers allow you to use your riding saddle like a pack saddle and take in more gear. Although you have to hike in, once there, you have your trail horse for day rides. Russ On... Why the TrailMax™ Saddlebag System?